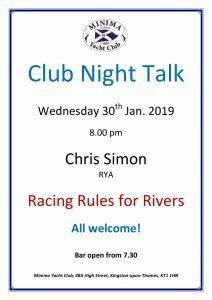 Minima YC (situated just above Kingston Bridge) are holding a rules talk to be given by Chris Simon, RYA. All are welcome. Minima Yacht Club 48a High Street Kingston upon Thames Surrey KT1 1HN Parking available in Drapers car park. Unfortunately you have to pay.